Kate could be described as a cross between an Adirondack mountain and a sourdough starter. Her two passions involve exploring the natural world and making things by hand. Raised in the Adirondack Park in upstate New York, she witnessed a community intertwined with the environment. This led her to pursue a degree in Environmental Science at Smith College. After graduating college Kate headed north to Alaska where she taught at the Campbell Creek Science Center for two years with the Student Conservation Association. She then went on to work at a residential school for rural Alaskan high school students. The only thing better than exploring is when you can explore with young people. 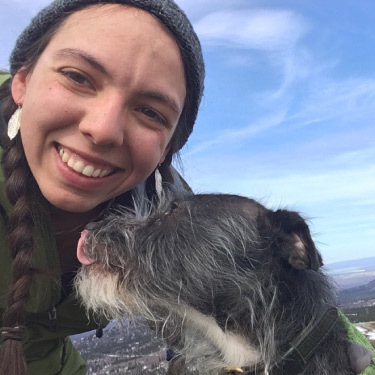 Kate and her students have backpacked through Crow Pass, investigated wolves and hares in Denali, rode bikes from San Francisco to San Luis Obispo, and camped out in snow shelters. Her personal motto is, “everyone’s mountain looks different”. She loves to help others identify their mountains and summit them with a smile. Kate can be found coasting through town on her bicycle (named Evangeline), practicing the fiddle (albeit poorly), loving public land, and foraging for edible plants.